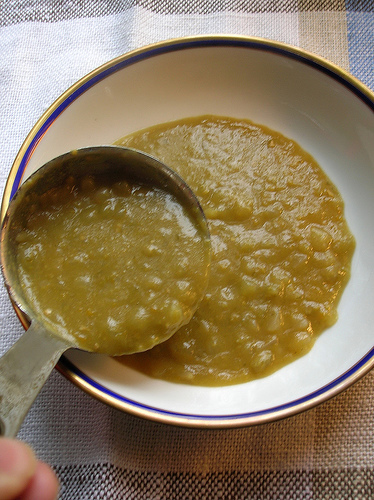 Care for Some Split Pea Soup? I made some split pea soup the other day. I usually make some at Christmas time. 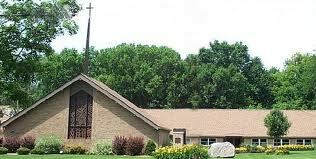 I do so in remembrance of a time when I was still a young child in Sunday School at St. George’s Episcopal Church in Milford, Michigan. It was the year that we had no money in our home–my father had invested all we had in his new business and there was little income (only my mother’s pay from part-time teaching). We weren’t dirt poor (although the new business was a nursery, raising trees and shrubs, so there was a lot of dirt invovled). We were investment poor. So, my mother announced that we would have split pea soup for Christmas dinner. Or maybe it was Thanksgiving dinner–either way, it was a real break with tradition. In Sunday School (I think it was when I was in first or second grade), we were asked what we were having for the holiday dinner. I loved pea soup, and so I raised my hand eagerly. “Yes, Robin?” asked the teacher (a well-meaning woman whose name I have mercifully forgotten). “We’re having pea soup,” I said proudly. 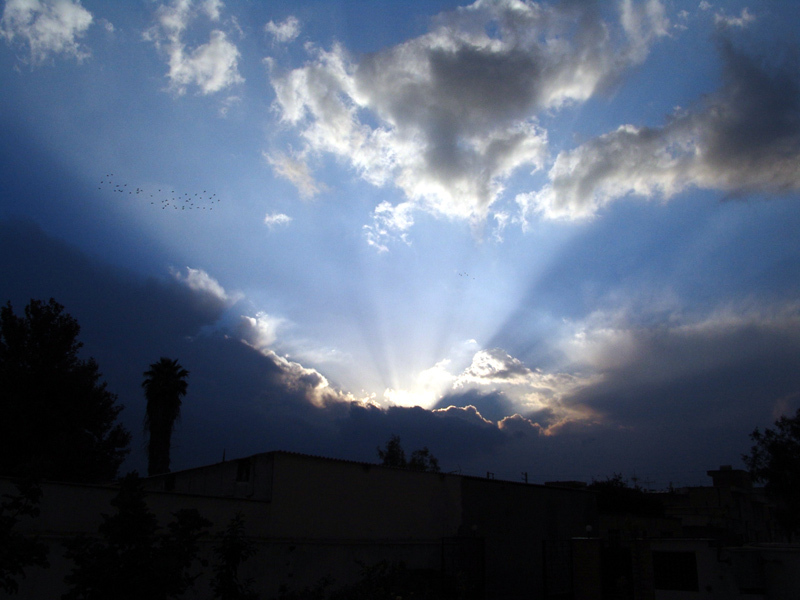 It began to dawn that day on me that church consisted of many different people–but that there are too fundamental groups in most churches: those who use the church as a way to confirm what they already “know” to be true (and don’t confuse us with any questions or new ideas), and those who use the church as a way to learn what new things God has for them. One of the reasons I so love our MCC movement is that we, much of the time, are unwilling to accept only that which the existing church tells us. We want to build God’s church, a new church–a church where split pea soup can be served alongside the turkey. I don’t know about you, but I sometimes enjoy rehearsing what is wrong in my life, sharing my physical aches and pains, the things that have gone (or are going) wrong, the hurtful things others have done. These recitations can get quite involved. I persist even when I see the eyes of my listener glaze over and their smile freeze in recognition that they are trapped and destined to listen for a while. But such “sharing” does not change anything for the better in my life. Indeed, if I get into a routine of this, I can actually cause myself more harm, perhaps even pain. I grew up when Dr. Norman Vincent Peale was popular (yes, this was in the last century–as I remember, Eisenhower was President). My father was very dismissive of Dr. Peale, saying he was just handing out quack medicine–people, my father said, should stop trying to sugar coat their lives with nostrums such as the “power of positive thinking,” and face the cold, hard truth of life’s pain and difficulty. I have heard many others do the same over the years, dismissing not only Dr. Peale but also many who have followed him. It is possible to use his idea to avoid reality. 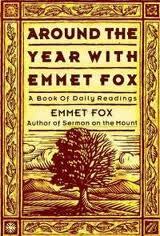 But Emmet Fox (and Dr. Peale) actually are all about reality–the one you create for yourself. In fact, in another writing, Fox cautions people against claiming their pain as their own. 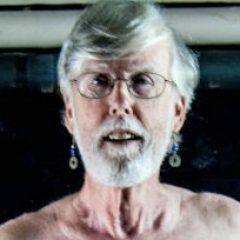 Don’t, he says, speak of “my rheumatism,” or “my unemployment.” He says when we do this sort of thing, the ailment becomes wholly ours, almost like a prized possession. We take pride in ownership. I know people who have developed this into an art form. I once had a work colleague who, when someone said, “Thank God, it’s Friday,” would say in response, “Well, I’m not so sure I’m happy about that–it is just that much closer to Monday.” She was stuck on the highway to pain and didn’t know how to get off. In contrast, Fox suggests we claim the cure as our own. This is a very Jesus-like idea–claiming that God is available and wants the highest and best for us. Focusing on the cure, like Jesus’ question to the man in the pool as recorded in John 5:6, indicates a desire to be healed, relying on the fact that God is a God of healing. With the thought, the hope, that cure–or even alleviation of suffering–is possible, comes less anxiety, less fear, and more peace of mind. For that, I am grateful to God. And my mind experiences greater peace. Trying to Eat Your Cake? 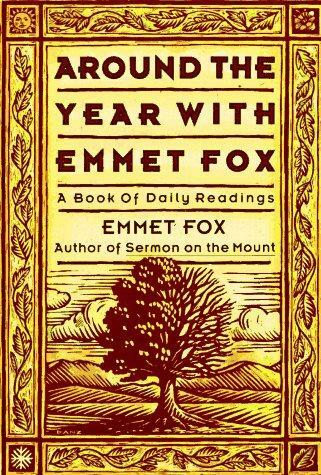 I am a regular reader of Around the Year with Emmet Fox, 365 daily selections from the writing and teaching of one of the leaders who developed positive thinking as a means towards spiritual health. He also was one of the spiritual advisors to Bill W and others as they began Alcoholics Anonymous. He begins with that one, and then adds six more. 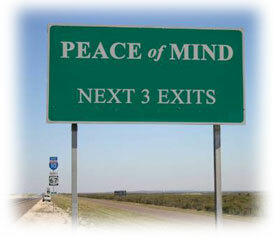 I am going to meditate on each one and share some thoughts about each one over the next few days. I hope you will go on this journey with me. And please respond if you wish–perhaps we could even get a conversation going. I know this is often used as a way to judge someone for making a mistake. It has been said to me more than once. I have said it to others, and about others. Often, the person saying it (me) uses a smug tone. But what if I apply it to myself? Obviously, I cannot meet my weight goal of 200 pounds by Easter if I eat a lot of cake (especially the fruitcake that is calling to me from the refrigerator at church)! But there is more. If I work too much, I cannot spend adequate quality time with Jonathan or Cocoa or my daughters and my beautiful granddaughter. On the other hand, if I don’t work enough, the church will not meet its mission and I might have to find another job (and God’s call on my heart may be denied). So this is about making choices. Life requires choices all the time. There is nothing I do that on some level I have not chosen to do. Oh, I want to blame someone else for whatever is going wrong, or is creating unhappiness in me, but the truth is that it is all my choice. Even those things that seem to not be a choice are a choice. She understands she has a choice. The truth is that she needs to allow more time in the morning for prayer. That will mean less time for something else (probably sleep). What is her priority? Is prayer really a top priority, or is it only a wish? You cannot have 10 minutes of prayer and sleep (or brush) the same ten minutes. Power’s on! That was the message from Jonathan after our electricity was out from Wednesday night until sometime in the early hours of Friday morning. Earlier, after the Wednesday night storm, I heard people asking each other, “Did you lose power?” Some would say it only flickered for a moment or two, while others, like us, said yes. But it got me to thinking. This language about electricity is misleading. We did not lose power. We lost connection to the electric grid. But we, Jonathan and I, still had all our power, all the power God gives us. Dominion Virginia Power has a lot of power, of course, but not as much as God. And God’s doesn’t ever lose connectivity. At least on God’s end. God’s the real p0wer. Divine Dominion Power–that’s a company in which I want to invest. Sometimes, not much. Other times, a lot. The numbers in Washington are daunting. It used to be, when I was much younger, that millions were a lot. Then it became billions. Now it is trillions. So what is the big deal for me about 218? 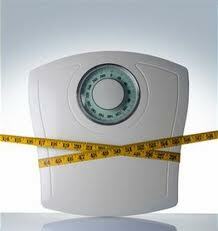 I weighed myself Monday morning–I do this every week–and I weighted 218 pounds. For the first time in at least a decade, I weighed less than 220 pounds. Glory Hallelujah! That is indeed good news. And even better is the fact that it says that the changes I have made in my eating habits, and the increase in walking I have undertaken the past several months, are working. I now feel real hope of making my goal of 200 by Easter (April 8, 2012). Already, I can feel the difference; my pants are not so tight. Maybe by Easter, I’ll need to buy some new ones! Most of all, I feel better already. And I know we’d all feel better if Congress and the President could get some reduction in the national waistline (but in that case, they need to both reduce the outgo and increase the income–sort of like me eating less starch but also eating more green vegetables). 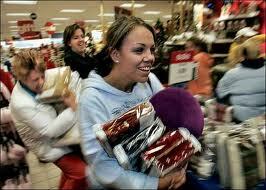 We survived Black Friday. At least, I hope you did. No mace in your face, I trust. I have been thinking a lot about how out of control things seem to be. Could it be that we, or at least many of us, are following the wrong path? Instead of seeing shopping–often called consumer spending to make it sound more profound–as the way out of our national, or global, troubles, perhaps we could rely on prayer and helping each other and spending time in meditation and helping the poor build new lives and hanging out with our loved ones and building community through participation in groups that matter to us. What would those sorts of things do? They would improve the true quality of our lives–far more than having the latest phone or the perfect toys for the adults, and children, in our lives. 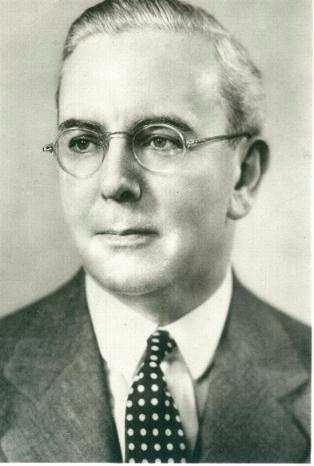 Emmet Fox asks, “What is your intelligence for if not to be used in building the kind of life you want?” Indeed. I don’t deny the need to jump start the economy, but somehow I think if we focused more on the quality of our lives and less on the quantity, we’d be doing a lot better. Jonathan and I had a great time this past Sunday at the Richmond Triangle Players. I have not laughed so hard and so often in a long time. And there are some appropriately serious and inspirational moments, too. 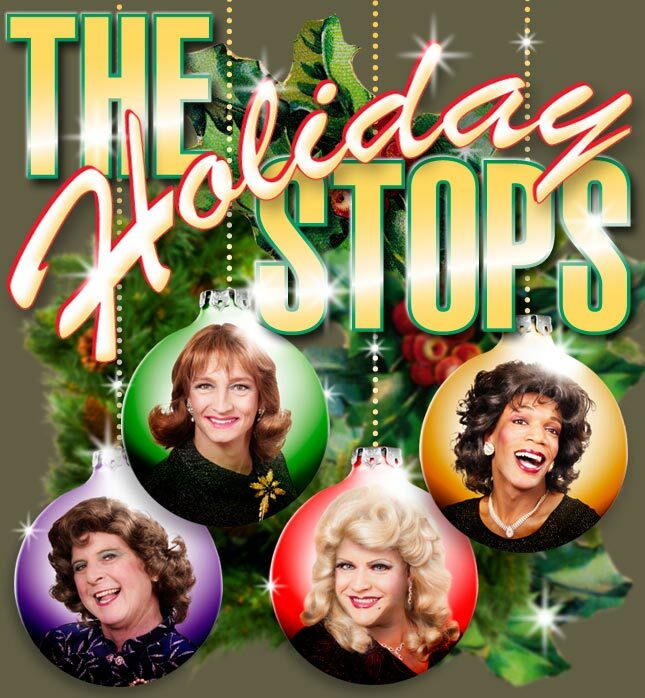 The name of the show is “The Holiday Stops,” and frankly I wish the holidays were like this all the time. Eric Lane Barnes, who wrote the book, music, and lyrics–and this is a world premiere, right here in Richmond!–has a hit. I am told that the music will be available on CD soon. I will buy one, for sure. The cast is four members of NALOG, the National Ladies Organists League, and they are played by four very talented men–Steve Boschen, Kirk Morton, Todd Minnich, and Andrew Etheredge. We stayed after the show to greet them, because although we knew they are men, we had to see for sure. They–and their make-up, clothes, and hair–are that good. And the singing is fabulous. I won’t spoil the show for you by telling you much about the plot, but I can say this: put together a lady organist with a penchant for preaching, another with a lust for Jim Beam and his friends, still another who is a Jewish lesbian, and add their newest friend, an African American organist from somewhere, and let the merriment begin. Don’t say I didn’t tell you . . . . this is a great present for you, and your special someone, and all your friends.